Gygax Magazine #3 was written by James Carpio, Stephen V. Cole, Michael Curtis, Jayson Elliot, Ben Gerber, Ernest Gary Gygax Jr, Jess Hartley, Timothy Kask, Brian A. Liberge, Ben McFarland, Jon Peterson, Benoist Poiré, James M. Ward, and Marc Zukerman. It was illustrated by Janet Aulisio, Clyde Caldwell, Pierre Carlès, John Dollar, Derek Fischer, Travis Hanson, Jim Holloway, Hanae Ko, Jeff Laubenstein, Charles Peale, and Michael Wilson. The publisher is TSR, Inc.
As with other discussions of "mixed bag" type products, my focus here is going to be on Dungeon Crawl Classics material. Gygax Magazine produced a total of six issues before closing. Apparently, there was some trademark dispute over the name "Gygax". Originally, with Ernie and Luke Gygax on board, TSR was willing to fight to use the name, but their withdrawal changed things. Or I may have that completely wrong. How do you stop a space amoeba? 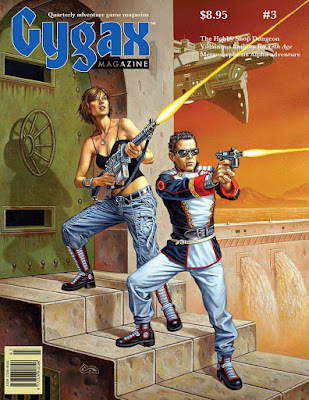 : A scenario for Federation Commander by Stephen V. Cole. The dwarven rune priest: The only specifically Dungeon Crawl Classics content in the six existing issues, this is an alternate dwarf class written by James Carpio. This is actually a great class, and dwarven rune magic is both flavorful and unique. In some ways, it is reminiscent to Hiero Desteen drawing runes from his bag in Hiero's Journey. You can use 1d24 to represent drawing runes, or you can actually purchase (or make!) a set of divination runes to use in the game. I have had a player use this class in my home game, and it was fun. The airlancer: A class for Advanced Dungeons & Dragons by Jayson Elliot. 16 Artifacts to impart ancient lore: This article, by Michael Curtis, describes five "unique relics that can grant valuable knowledge to player characters". Although not specific to Dungeon Crawl Classics, it is easily adapted. Master Mariner: Naval rules for the Pirates constructable game by Timothy Kask. Nuffle’s Academy: Creating a Blood Bowl team, by Marc Zukerman. Argyle & Crew’s Scavenger Hunt: "A sock puppet RPG for kids at conventions, or anywhere". The author is Ben Gerber. How to split up the party: "Need advice on social etiquette relating to games, movies, fan groups, conventions, or other geek-ful settings?" Jess Hartley provides the same. In this case, "What do you do when one of your players just isn’t working out?" They all Died at the International Space Station: A Metamorphosis Alpha adventure by James M. Ward. The Hobby Shop Dungeon: Jon Peterson provides a history of The Hobby Shop Dungeon and The Marmoreal Tomb going "all the way back to the early days in Lake Geneva". The Marmoreal Tomb of Garn Pat’uul: Written by Ernest Gary Gygax Jr. and Benoist Poiré, this is the first level of The Hobby Shop Dungeon "for all first edition-compatible games". This may be of interest to Dungeon Crawl Classics aficionados, as the Marmoreal Tomb kickstarter reached its $70,000 stretch goal - A Dungeon Crawl Classics conversion document headed (or written) by Jen Brinkman! Order of the Knights Incorporeal: For 13th Age, written by Brian A. Liberge. Savage charms and monstrous fetishes: For Pathfinder, written by Ben McFarland. Full Frontal Nerdity: Comic by Aaron Williams. The Order of the Stick: Comic by Rich Burlew. 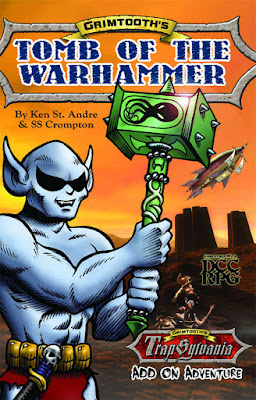 Grimtooth's Tomb of the Warhammer is a 4th level adventure by Ken St. Andre and Steven S. Crompton, with Dungeon Crawl Classics statistics by Terry Olson. It was illustrated by S.S. Crompton. The publisher is Goodman Games, under license from Flying Buffalo, Inc. If you want to know a little more about Grimtooth and Trapsylvania, read here or Steven Crompton's blog post here. The second link also discusses Tomb of the Warhammer. As with Grimtooth's Museum of Death, this adventure is not for the faint of heart. The tone also matches that of the Flying Buffalo Grimstooth products, not surprisingly as Steven Crompton has been there since the beginning. There is no small bit of silliness at the heart of the blood-soaked events, which may seem off-kilter in an ongoing campaign milieu. In this adventure, the PCs enter the Tomb of Grimfang, Grimtooth's father. It is a killer dungeon. The authors are upfront about that. "The Judge should be relentless in his attempts to slay the party, but don't do it too easily." I would find it hard to use this adventure as written in an ongoing campaign. As a one-shot, a dream sequence, or an alternate plane of existence/planet, though, who knows? As part of Grimtooth's Trapsylvania, where the players know to fear to tread...well, everywhere? Probably. 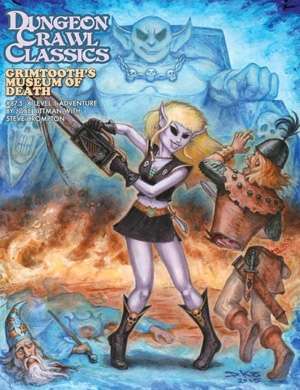 DCC #87.5 Grimtooth's Museum of Death is a 1st level adventure by Jobe Bittman with Steven S. Crompton. It was illustrated by Doug Kovacs, S.S. Crompton, Stefan Poag, and Brad McDevitt. The publisher is Goodman Games. A bit of history: Flying Buffalo Games published the first Grimtooth's Traps book in 1981, leading the market in traps that you might hesitate to place in your dungeons. These traps were tough, and what they would do to the PCs who fell into them was often tougher still, but they generally had internally logical rules that would allow very canny players to defeat them. The "mascot" of these books was a troll named Grimtooth. It didn't take long at all for gamers to learn to associate the name "Grimtooth" with "Killer Dungeon". Many moons ago, the adventurous entrepreneurs at Goodman Games visited my realm, and seeing its wonders, begged me to reveal to unwashed humanity, the splendors and horrors of Trapsylvania. After sufficient groveling and the payment of vast sums of platinum ingots, I agreed to give them a tome of greatness that would lay out my little empire so that GMs and dungeon masters everywhere might benefit from my vast wisdom. The book is all written and I even allowed Goodman Games to add appropriate DCC stats and info on all the characters, creatures and traps within the book, so that all you Dungeon Crawl Classics players could use this book all the easier. There are of course my usual 1-5 skull ratings so that everyone else can use this book as well. From the April 2017 update, it seems quite clear that a Grimtooth's Trapsylvania kickstarter is in the near future. If Grimtooth, the Troll of Trolls, is synonymous with the killer dungeon, then Grimtooth's Museum of Death lives up to all expectations. That said, it is nonetheless survivable, and it is possible even to profit from your excursion to Castle Grimtooth. Stats are given for both Grimtooth and Grimtina...if you attack them, you are very likely going to die. Very, very likely. Even more likely than that. Then again, the odds are also good that you are going to die if you do not attack them, but merely tackle the dungeons below Castle Grimtooth as planned. You may wish to bring your second-best character. The dungeon is "extremely hazardous and completely unfair"...so much so that an "Accidental Death & Dismemberment" sidebar is provided for "[w]eak-hearted judges" who wish to "temper the lethality of the traps". 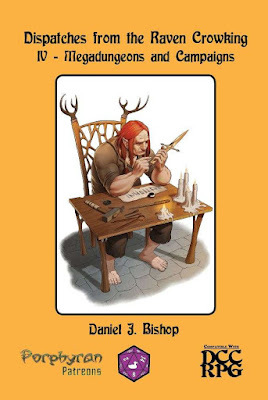 Of great potential interest to the judge who remembers the Grimtooth's Traps series with fondness, the authors supply a complete patron write-up of the Great Troll, including all patron spells. Not for the faint of heart. Perhaps not for regular campaign play, both due to tone and lethality. Nonetheless, you can adventure like it's 1981. After three decades of preparation, the evil troll Grimtooth has finally thrown wide the gates of his abode to all comers. The troll has sent ravens far and wide inviting delvers to share in the vast wealth of his treasure room. Of course, there is a catch. The adventurers must wend their way through a maze of traps in Grimtooth’s Museum of Death, a curated collection of the deadliest and most devious traps ever assembled in one place. Along the way, they might even cross paths with a few of Grimtooth’s allies: Grimtina, Spike the Grimdog, and Sludgeworth. Tread lightly, delver. There are no refunds for this tour. 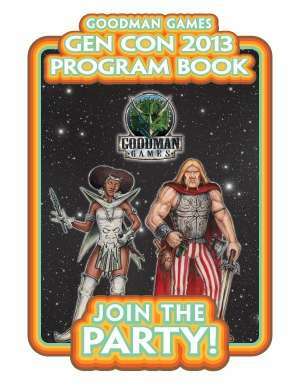 The Goodman Games Gen Con 2016 Program Book is described on RPG Now as being written and illustrated by Goodman Games, and is published by Goodman Games as well. Apart from specific adventures or articles, and self-reporting (bios, author notes, etc. ), I didn't see any other attribution. Disclosure: I was one of the authors of Death by Nexus. At over 150 pages for what is ostensibly a convention guide, Joseph Goodman continues his policy of giving birth to monsters. As with other discussions of "mixed bag" type products, my focus here is going to be on Dungeon Crawl Classics material. Two More New Letters for The Dungeon Alphabet: These expansions, by Michael Curtis, are G is Also for Guardians and H is also for Hazard. These are completely written and laid out with full art, making me suspect that there may be a new, expanded printing of The Dungeon Alphabet somewhere on the horizon. Forty Years of Metamorphosis Alpha: A Legacy of Innovation: Author Craig Brain discusses the 40th anniversary of Metamorphosis Alpha. Metamorphosis Alpha: 4 Tables of 40: Tables provided by James M. Ward. The Way of Serpents: Fiction by Howard Andrew Jones, followed by Dungeon Crawl Classics statistics by Terry Olson. The Return of the Wild: Michael Curtis offers up Nengal the Wild One, a primordial patron of the Shudder Mountains. Everything but spells is provided. This is a druid-based patron which could be used in many Dungeon Crawl Classics milieus. 1970's Earth Characters for DCC: Deiter Zimmerman provides everything you need to create 0-level PCs from circa 1970's earth. Now you really can adventure like its 1974! Not in Kansas Anymore: A level 0 adventure by Dieter Zimmerman with Matt Sprengeler, which takes circa 1970's earth PCs to the worlds of Dungeon Crawl Classics. Hero Memories, included in the funnel, are interesting and give new players a sense of higher-level play. 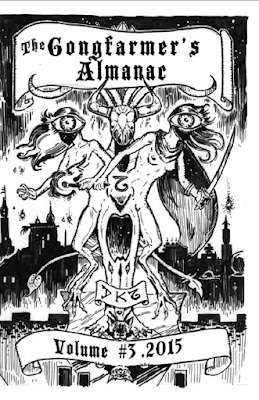 Rat-Snake: A Lankhmar Wagering Game With Dice: It should not be surprising that this is written by Michael Curtis, based off a game mentioned by Fritz Leiber in The Bleak Shore. The Hand of St. Heveskin: Michael Curtis provides a relic, the hand of a devout priest of the Rat God, suitable for DCC Lankhmar or other Dungeon Crawl Classics milieus. Fafhrd and Gray Mouser Stories, by Publication Date: Exactly what it says it is. The Way of the Dagon: Herein you wild alternative spell duel rules by Harley Stroh, based upon an event from Gen Con 2015. "Magic behaves strangely at the whims of Father Dagon." How to Run a DCC Tournament Funnel: Worth reading if you want to do this. Also, you can listen to this episode of Spellburn. Or read this. Death by Nexus: This is a level 0 tournament adventure by Jim Wampler, Stephen Newton, Daniel J. Bishop, Jefrey Tadlock, Jon Marr, and Bob Brinkman. I wrote the section called The October Wood. One neat thing about this tournament adventure is that, because the primary opponents are other PCs, the inspired judge could run it for any level PCs with only minor tweaking. Indeed, one could use a single arena as an event in the PCs' lives at any level, where the normal Band is confronted by two NPC groups. This is a great opportunity for guest players, which will have an effect on your regular campaign milieu, but won't leave you trying to explain where the guest PCs went. Appendix N Inspirations: Discussions of the works from Appendix N that influenced various projects and authors. Included are Peril on the Purple Planet (Harley Stroh), Against the Atomic Overlord (Edgar D. Johnson III), The Chained Coffin (Michael Curtis), The 998th Conclave of Wizards (Jobe Bittman), and Doom of the Savage Kings (Harley Stroh). An Illustrated Interview With Erol Otus: Including both black & white and color illustrations. Appendix D: Ythothian Liche Kings: Another expansion of the Purple Planet Author's Edition Glossography by Harley Stroh. Will the Gossography ever be published in full for those of us who couldn't purchase the Author's Edition? Only time will tell. Forty Yeast of Judges Guild: A Legacy of Awesome: By Jeff Rients.What the title says it is. Unknown Gods: Revised and Expanded: Bob Bledsaw, Sr., and Bob Bledsaw, Jr. expand on Unknown Gods, a Judges Guild product written in 1979. The Gary Con Trivia Contest: Compiled by Joseph Goodman from questions submitted by Bob Bledsaw Jr., Steve Crompton, Joseph Goodman, Allan Grohe, Ernie Gygax, Jon Hersberger, Rick Loomis, Erol Otus, Paul O'Connor, Paul Stormberg, and James M. Ward. Including a Lankhmar Trivia Contest from Gary Con 2015, and a list of the birthdays of various Appendix N authors. 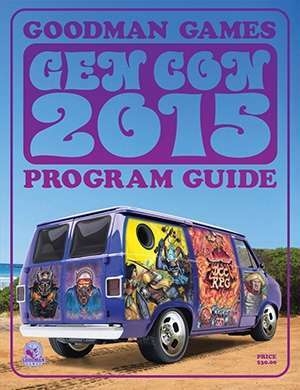 Gen Con 2015 Recap: What is claims to be, with pictures. Gary Con 2016: Also with pictures. Roadworthy: Interviews by Brendan LaSalle: Brendan LaSalle interviews judges from the Road Crew, including Asia Pickle, Tom Evans, Cory "DM Cojo" Gahsman, and Sarah Brown. Goodman Games World Tour 2016: Gen Con event guide. 2015-2016 Mailing Label Art: Because it is cool. Dear Archmage Abbey: Fun flummery. 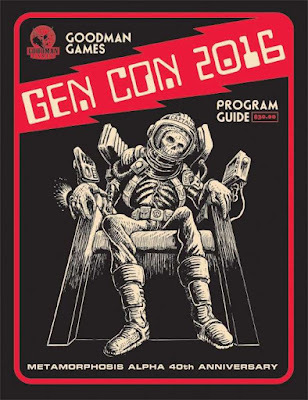 The Goodman Games Gen Con 2015 Program Book is described on RPG Now as being written and illustrated by Goodman Games, and is published by Goodman Games as well. Apart from specific adventures or articles, and self-reporting (bios, author notes, etc. ), I didn't see any other attribution. Disclosure: I wrote The Black Feather Blade for this product, and was one of the authors of The Hypercube of Myt. This is a monster of a book. Seriously, this thing is well over 200 pages. As with other discussions of "mixed bag" type products, my focus here is going to be on Dungeon Crawl Classics material. In this case, that's entirely necessary, or you'd need an hour or more to read this post. Nice van on the cover. Let's look inside! Tables For Thieves: Useful tables for any game featuring thieves, cut-throats, and other murderous rogues. Dieter Zimmerman supplies 8 Places to Have a Secret Meeting, 12 Places to Find a Hidden Key, 20 Items for Sale on the Black Market, and 14 Members of the City Watch. It says "Continued on page 152", but it is not. It is on page 154. There you get 8 Ways to Pass the Time in Prison, 10 Odd Jobs Assigned by the Thieves' Guild, and 24 Interesting Things Found in a Stolen Pouch. Interview With Lou Zocchi: Colonel Lou Zocchi is "the original dice guy", who you might remember from the zocchihedron die. Learn more about him. Cranking Up the Funk in DCC Dice Rolling: Author Terry Olson tells you everything you wanted to know about odds in rolling dice, but were afraid to ask. He explains the dice chain, gives a couple of alternate methods of rolling ability scores, looks at critical hits, and mercurial magic, suggesting methods that the dice can be used to get more interesting results at the table. Twenty Funky Dice Tables: Ken St. Andre provides twenty tables, from the relatively useless (D5: Five Games You Can Play With Your Parents) to the potentially useful (D12: When Good Magic Goes Bad). This is mostly an exercise in whimsical fun. The Black Feather Blade: A level 1 adventure by Daniel J. Bishop, this offering sees your PCs attempt to gain the titular weapon before two NPC parties do. The adventure is themed around Malotoch the Carrion Crow God, so there are plenty of body parts involved. As such, there is a Luck mechanic called "Malotoch's Favor". Use it. The idea of the NPC parties was a nod to Robert E. Howard's The Black Stranger. In this story, three factions (one being Conan) maneuver to gain the treasure of Tranicos while a sinister figure menaces all. The burial tomb at Area F is inspired by that master of the haunted tale, M.R. James, and his story, Oh, Whistle, and I'll Come to You, My Lad. The "raven-headed horror" in Area C4 was originally vulture-headed...because in an email about a year previous to writing this, Joseph Goodman suggested that he would like to see a vulture-headed creature in an adventure sometime. I thought that I would oblige. That's also why the corpse eaters in Area A have two elbows on each arm and two knees on each leg. Same email. 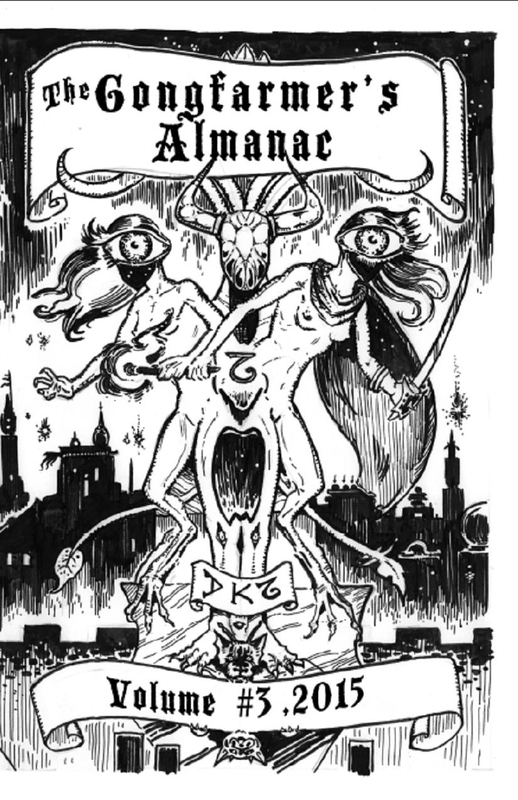 Xcrawl Apocalyse: The Athelete: "Dungeon Crawl Classics and Xcrawl come together at last! Get ready for the unholy spawn of Dungeon Crawl Classics, the dark RPG of glory and gold won by sword and spell, and Xcrawl, the game that’s nastier than a Type II demon with Type III herpes. Welcome to Xcrawl Apocalypse!" Brendan LaSalle offers the first class for this new unholy union. Appendix F: The Ythoth Raider: An expansion of the Purple Planet Author’s Edition Glossography: This is the Ythoth Raider class by Harley Stroh, creator of the Purple Planet. Evil Reborn: Jon Hook offers a 4th level adventure which is essentially a sequel to DCC #13: Crypt of the Devil Lich. DCC #13 was written for 3rd Edition Dungeons & Dragons, but this is a Dungeon Crawl Classics adventure which brings elements from the original adventure into the DCC fold. DCC World Tour 2014: Including scenes from the road with the Goodman Games crew. Art Folio: Doug Kovacs: In color. Art Folio: William McAusland: Also in color. Not all of the Seven Pits were explored during the convention. Submitted for your consideration: two areas that saw the least exploration, and the seventh and final pit of Sezrekan. I don't know about you, but I would like to see the Seven Pits of Serzrekan available for purchase someday. Funnel Character Sheet: For DCC Funnel Tournaments. You can now get these sheets pre-filled at Purple Sorcerer's website. How to Run a DCC RPG Tournament Funnel: Worth reading if you want to do this. Also, you can listen to this episode of Spellburn. Or read this. Dear Archmage Abbey: Fun flummery, as in the previous year. The Hypercube of Myt: This is a 0-level tournament adventure written by Jim Wampler, Stephen Newton, Daniel J. Bishop, Dak Ultimak, Adam Muszkiewicz, and Jeffrey Tadlock. 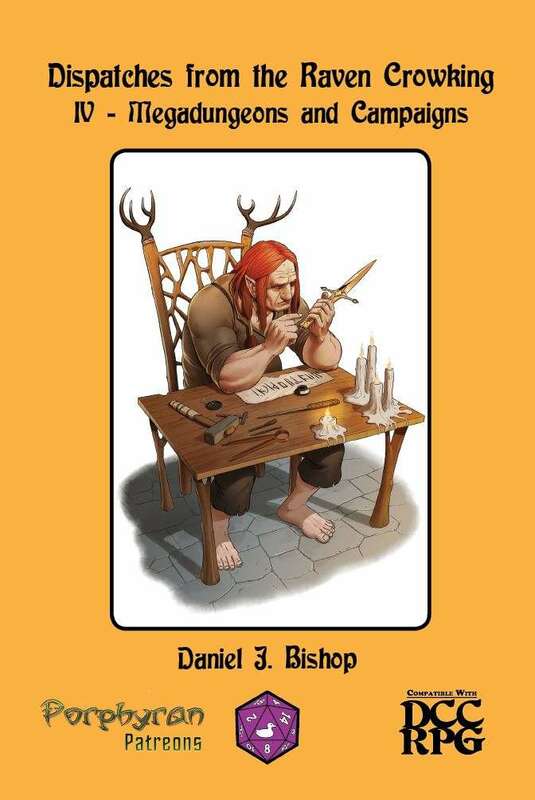 It was available as a free pdf for Free Role-Playing Game Day in 2015. I ran it at Dueling Grounds in Toronto. I was responsible for the Endless Hallway, which I originally envisioned as a length of cosmic intestine, causing me to create a few things that didn't fit in the final version. New Devices for the Starship Warden: Robert Payne offers some new devices for James W. Ward's Metamorphosis Alpha. Even More Mutations: Dieter Zimmerman offers some new mutations for James W. Ward's Metamorphosis Alpha. Some of the things in these two articles may be transferable to Dungeon Crawl Classics, particularly Crawling Under a Broken Moon, Crawljammer, or Mutant Crawl Classics. 2015 Mailing Labels: Because Goodman Games' mailing labels rock. Maximum Xcrawl: Best Possible Combination: Fiction by Brendan LaSalle. Art Folio: Doug Kovacs: Now in glorious black and white. Including interviews with the gentleman artist. Monster Alphabet titles, here is a brief look at abecedarian inspiration from the works of H.P. Lovecraft. If you enjoy this concept, let us know...perhaps we’ll make a book of it!" How is this not a thing already? Here we get D is For Deep Ones, M is For Madness, T is for Tentacles, and W is for Worshippers. Again, how is this not a thing already? Art Folio: William McAusland: Now also in glorious black and white. Now also including interviews with the gentleman artist. I have to admit, Joseph Goodman has a good eye for hiring excellent artists, as paging through literally any Goodman Games product will attest! Mutant Crawl Classics Preview: This is exactly what it says on the tin. Goodman Games has made this preview available here as a free pdf download. Journey to the Hole in the Sky: Fiction by Brendan J. LaSalle, based on The Hole in the Sky. Judge's Guild 1977 Fantasy Catalog: A reproduction only. Do not try to order from this catalog without an operational TARDIS! The Gamer's Yearbook: Mostly flummery, in the style of the wanted ads and agony columns of yore. The Goodman Games Gen Con 2014 Program Book is described on RPG Now as being written and illustrated by Goodman Games, and is published by Goodman Games as well. Apart from specific adventures, and self-reporting (bios, author notes, etc. ), I didn't see any other attribution. Disclosure: There is a preview for my The Dread God Al-Khazadar in this volume, with my Designer Notes and a short bio. As with other discussions of "mixed bag" type products, my focus here is going to be on Dungeon Crawl Classics material. Let's look inside! Gen Con Luck Chart: Not listed in the Table of Contents. You might have gotten a freebie from the Goodman Games crew if you rolled at the Goodman Games booth. Or you might have been asked to "Provide Doug [Kovacs] with a pint of your own blood to be mixed into his paint for the next DCC RPG cover." Seems to be the same as last year. Age of Cthulhu: Transatlantic Terror: An adventure by Jon Hook for 1920s Call of Cthulhu. Could this be turned into a funnel scenario using Dungeon Crawl Classics period-based characters? Yes it could. Dear Archmage Abbey: A bit of fun flummery. DCC RPG Worlds Tour: Not sure why this made it to the Table of Contents. Tales From the Road Crew: Stories and pictures of Dungeon Crawl Classics events featuring the Goodman Games crew, "The Curse of Many Faces" and "The Battle of Gary Con". DCC Bonus Encounters: Preordering Intrigue at the Court of Chaos, The One Who Watches From Below, and Bride of the Black Manse gave you a chance to receive postcard-sized extras printed with extra encounter areas. These are reprinted here. The Emerald Enchanter Strikes Back: In true Appendix N style, author Jobe Bittman reveals that the Emerald Enchanter did not die at the end of his titular adventure. Now he wants his vengeance, and he has a giant robot to help him do it. Not only that, but there is a nod to Doom of the Savage Kings! 2014 Mailing Labels: Cool art. The DCC Cover Design Process: More cool art, and information about how those covers are designed. The ABECEDARIAN Adventure: Featuring expanded material for The Dungeon Alphabet (O is Also for Omens by Michael Curtis, and no, it isn't in my expanded copy either, so I guess you can only get it in this Program Book!) and previewing the upcoming (at the time) The Monster Alphabet. Maximum Xcrawl: Too Tough to Die: Fiction by C. L. Werner. Metamorphosis Alpha: Coming of Age: An adventure by James M. Ward. Once again, I am going to suggest that this could be converted to Dungeon Crawl Classics...perhaps using The Umerican Survival Guide and Mutant Crawl Classics (when these become available) as handy source books for doing so. Coming Soon for DCC RPG: Previews (with designer notes and bios) for several products. These are Against the Atomic Overlord, The 998th Conclave of Wizards, Journey to the Centre of Aereth, Hole in the Sky, The Dread God Al-Khazadar, The Making of the Ghost Ring, and The Four Phantasmagorias. This last product, by Michael Curtis, is still in the wings somewhere. All good things take time, and I imagine DCC Lankhmar has taken up a wee bit of Mr. Curtis' time between then and now. In addition, Joseph Goodman has a sidebar about Alien Planets in this section. Other Products Coming Soon: The Adventurer's Almanac, GM Gems, Age of Cthulhu: The Lost Expedition, and two other "exciting hardcovers" that were announced at the "What's New With Goodman Games?" seminar. If memory serves, these should be Grimtooth's Traps and the Judges Guild Deluxe Collector's Edition. D40 Questions: The Goodman Gang: The Goodman Games crew answer some randomly generated questions from a list of 40. Included are Jobe Bittmen, Mike Curtis, Joseph Goodman, Jon Hershberger, Keith Labaw, Brendan LaSalle, Doug Kovacs (who gets &^#! @ bleeped! ), Brad McDevitt, Peter Mullen, Stefan Poag, Harley Stroh, and Dieter Zimmerman. The Vandroid: Finally, Joseph Goodman delivers a "robot created from the components of a classic 1970's Ford custom van." Full DCC stats included. 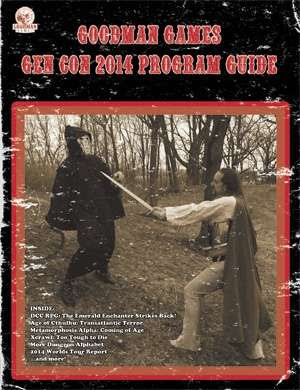 The Goodman Games Gen Con 2013 Program Book is described on RPG Now as being written and illustrated by Goodman Games, and is published by Goodman Games as well. Apart from specific adventures, and self-reporting (bios, author notes, etc. ), I didn't see any other attribution. This was the first of the now-annual Goodman Games Program Books, compiled for the 12th anniversary of the publisher. Joseph Goodman wrote: "This Program Book is a new idea for communicating with our fans. It’s full of sneak previews, staff bios, insider info, convention coupons, and other fun tidbits. Let me know if you think we should keep it around next year." Obviously, there was enough positive feedback to keep the Program Books coming! Gen Con Luck Chart: Not listed in the Table of Contents. You might have gotten a freebie from the Goodman Games crew if you rolled at the Goodman Games booth. Or you might have been asked to "Provide Doug [Kovacs] with a pint of your own blood to be mixed into his paint for the next DCC RPG cover." Bios of the Band: Harley Stroh, Doug Kovacs, Brendan LaSalle, Michael Curtis, Brad McDevitt, Stefan Poag, Peter Mullen, Dieter Zimmerman, Keith Labaw, Jon Hershberger, and Joseph Goodman get brief bios. Dungeon Crawl Classics statistics are, sadly, not provided. The Band: Pictures of the Band from various modules, from DCC #67 (Sailors on the Starless Sea) to DCC #79 (Frozen in Time), with small descriptions for how and why the line-up has changed. What’s next for DCC RPG? : Goodman Games announces some upcoming releases: Intrigue at the Court of Chaos, The One Who Watches From Below, The Black Manse, The Chained Coffin, Peril on the Purple Planet, and Glipkerio's Gambit. You will note that titles may change from announcement to release. Author notes are interesting. What’s next for Age of Cthulhu? : Starfall Over the Plateau of Leng. Don't imagine that you can't convert Age of Cthulhu to Dungeon Crawl Classics. Of interest, on the first page of this section there is a note: "But what about the Annual? We knew you DCC RPG fans would ask. It’s out there lurking, waiting for the right time to be announced. Think 2014 — along with some other exciting hardbacks and boxed sets..."
What’s next for Systems Neutral? : Some information on the long-awaited Adventurers Almanac by Michael Curtis, GM Gems in hardcover, and The Monster Alphabet by Jobe Bittman with Michael Curtis. A sample table is included: X is for Xenotransplant. DCC RPG adventure: The Undulating Corruption: This level 5 Dungeon Crawl Classics adventure by Michael Curtis was featured in the Goodman Games Free RPG Day 2012 release. DCC RPG adventure: The Jeweler that Dealt in Stardust: This level 3 Dungeon Crawl Classics adventure by Harley Stroh was also featured in the Goodman Games Free RPG Day 2012 release. World Tour Poster: I'm not really sure why this made the Table of Contents. What’s Next for Xcrawl? : Notification that Maximum Xcrawl is (was) ready for pre-order. Maximum Xcrawl Preview: Overview of the world of Maximum Xcrawl, and character creation rules. Maximum Xcrawl uses Pathfinder for its engine. When this came out, we were still years away from Dungeon Crawl Classics-powered Xcrawl adventures! Maximum Xcrawl adventure: 2013 Studio City Crawl: A level 6-8 adventure, by Brendan LaSalle, using Pathfinder-based rules. Gen Con Event Schedule and Exclusives: The listed exclusives were DCC #78: Fate’s Fell Hand (gold foil cover), DCC #78.5: Tower of the Black Pearl, the DCC RPG Official Bag of Weird Dice, Gen Con 2013 T-shirt "...plus swag! DCC RPG buttons Xcrawl giant foam hands ...and more!" Scenes From the Tour: Pictures from the Goodman Games World Tour featuring the Goodman Games Band. Join the DCC RPG Road Crew! : What you got in 2013 for being a Road Crew judge. 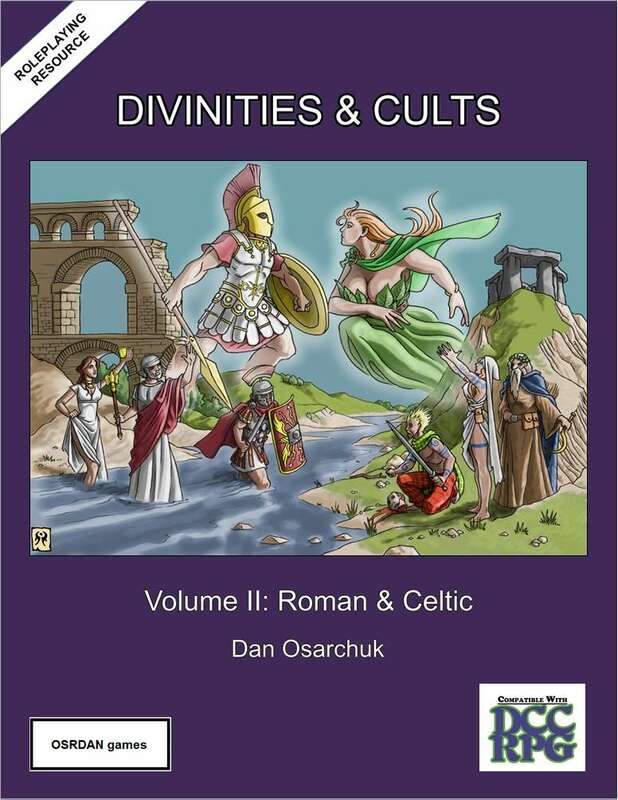 Divinities & Cults Volume II: Roman & Celtic was written by Dan Osarchuk and illustrated by Luigi Castellani. Stock art was also used. The publisher is OSRDAN games. This product was originally designed for Labyrinth Lord, so the prospective judge may discover some tweaking is necessary to get the best use with Dungeon Crawl Classics. Nonetheless, there is a wealth of material here, and the value for price point is more than adequate! In addition, there are write-ups for five "Demon Lords, Etc. ": Balor, Beliah, Enak, Orcus, and Thrym. Enak is the "Lawful (Evil) Arch-Devil of Technology", who would thus be appropriate to a Crawling Under a Broken Moon or a Crawljammer campaign. 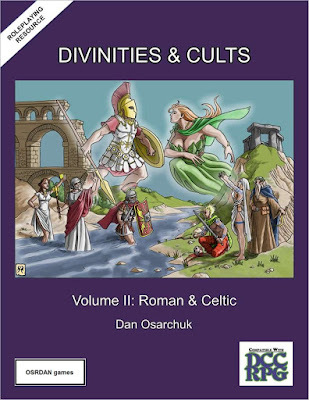 Appendix A: Additional Divinities offers brief write-ups of expanded Greek, Norse, Roman, and Celtic pantheons. Appendix B: Additional Divinity Considerations for Volume I offers minor tweaks to the information found in Volume I. Appendix C: Magic of the Gods supplies some methods of modifying idol magic spell checks. In addition, there are a number of sidebars and random encounter options. One random encounter option that is particularly useful is "Cleric Encounters & Disposition". You encounter a cleric? What does she want? That depends upon who her deity is, and a random die roll. Nodes, Otherworlds, and Underworld Encounters will be useful for most games. Brothel Encounters will be useful in some. It is also nice that the outdoor encounters include things like changes in weather and surface terrain. This work is both imaginative and well-researched. Whether you are going to use it as-is, or use it to spur your own creativity, it will make your pantheons - and by extension, your clerics - more distinctive and flavorful. Dispatches from the Raven Crowking Vol. IV: Megadungeons and Campaigns was written by Daniel J. Bishop. Artwork is by Tamas Baranya, Gary Dupuis, Jacob Blackmon, and Kristen M. Collins. The publisher is Purple Duck Games. This is the second Porphyran Patreons product produced for Dungeon Crawl Classics. This product is made possible with the generous support of Purple Duck's Patreons: Craig, Daniel Bishop, Diogo Nogueria, EnochSeven, Geoff Forcella, Hunyock, Jeff Goad, Jeremy Friesen, Keith Nelson, Lorne Cooper, M Woolsey, Maxwell Spann, Michael Jones, Patrick Pilgrim, Paul Go, Rompcat, Ryan, Stephen Murrish, Stewart Wilson, Terry Olson, Tony Hogard, Trevor Bramble, and Wes Fournier. Disclosure: I am the author, and also a Patreon. This fourth volume of Dispatches focuses on megadungeons, but contains advice that applies to developing campaigns as well. As with previous volumes, this material largely consists of reworked blog posts from Raven Crowking's Nest. Dungeon Crawl Classics: Short Story or Novel? : Which way do we view this game? A sporadic series of short adventures, or a well-developed game? An argument may be made for both, but can you safely invoke Appendix N to bolster the "sporadic adventures" side? Balanced Encounters: Who manages risk? The players or the judge? M is for Megadungeons: We now leap into the design phase of making a megadungeon as part of a persistent campaign milieu. The next sections (The Importance of Names, Evocative Monsters, Legendary Treasures, Brainstorming, Pattern Mapping, Placing Elements, and From General to Specific) all follow a method of creating and then placing elements within a whole. By the end, we have a general layout plan for a megadungeon, as well as an overview of the above-ground portions of a ruined town. In fact, the ruins of Balton Major, the village of Balton Minor, and the environs of the Greenshaw forest may be developed in full for Purple Duck at some future point. Otyughs: Dwellers in Filth: "Deep beneath the city, where the offal from the sewers collects in deep pits, dwell the dreaded otyughs." This is a Dungeon Crawl Classics write-up of a Dungeons & Dragons staple. The Megadungeon and Dungeon Crawl Classics: This article offers another way of looking at megadungeons in Dungeon Crawl Classics. 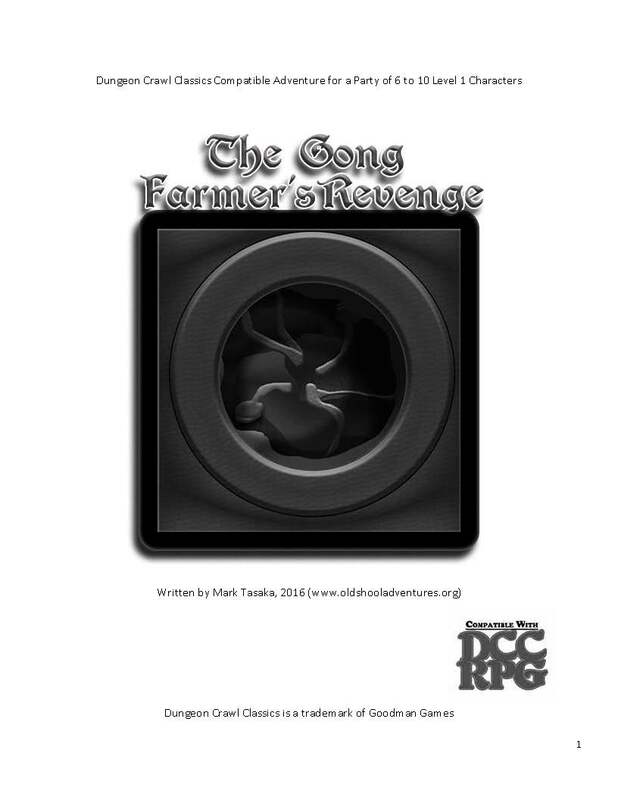 The Gong Farmer's Revenge, by Mark Tasaka (writing and cartography), is a Dungeon Crawl Classics adventure for 6-10 level 1 characters. It is published by Old School Adventures. This adventure follows the events of Kobolds Stole My Cat. Although the earlier adventure doesn't need to be played to use The Gongfarmer's Revenge, the two adventures are clearly intended to be used together, as several plot elements and characters are introduced in Kobolds Stole My Cat. The Gong Farmer's Revenge is an interesting work, but one that the aspiring judge will want to go through carefully before running. The area around the village of Greenleaf, for instance, may seem too dangerous to be believable for many judges, but the encounters provided need not all be run as part of this adventure. I quite like the encounter with the ravens and the giant spider, which has a fairy tale feel to it which would fit well with a milieu in which includes Bride of the Darkened Rider and/or Creeping Beauties of the Wood. I also rather liked that the author considered three possible outcomes for the adventure, dependng upon the choices of the players and their characters' success at bringing those choices to fruition. It is unfortunate that the author is far enough removed from a medieval agrarian existence that he didn't understand the potential importance of gong farming both to supply fertilizer and, later, to supply niter (saltpeter) for the manufacture of gunpowder and explosives. Our gong farmer, taken back for trial, could not only claim that he was protecting the livelihood of himself and his kith, but potentially that of Greenleaf's farming community! If you roll up a gongfarmer as your starting occupation, you gain a bag of night soil as your trade goods. Human waste was called "night soil" because, in Tudor England, there were strict laws about when it could be collected due to the stench. A cruel judge, or one who merely cares about verisimilitude, can add an element of the overpowering odor of human waste to the dwelling of the vengeful gong farmer of the adventure's title. "Oscar" and her kind may be the most interesting element in the adventure, perhaps because they are not fleshed out. Regardless of how your group handles the gong farmer, if any of Oscar's children managed to survive, hidden away in the connected latrine-pits of Greenleaf, they may arise one day to avenge their slain mother. Perhaps that was always their plan. Or perhaps they just want to eat night soil in the "comfort" of their own outhouses. There are also some language issues you'll want to be aware of: I recommend reading the read-aloud text aloud before running this adventure, and then either paraphrasing or editing the text to match the natural cadence of your normal speech. Watch out for assumptions about what the PCs are doing as well. Please note that this is a free adventure, and the author went out of his way to include things like an Appendix offering a full character sheet for an NPC who may accompany the PCs. None of the foregoing is meant to dissuade you from this product which, if a bit whimisical or rough-around-the-edges in places, will still offer you a solid session or two of gaming, a few new monsters for your campaign milieu, and (with Kobolds Stole My Cat) an example of how adventures may be linked together. Credited to Dan Domme on Lulu, the 2016 edition of The Gongfarmer’s Almanac was a massive undertaking written, illustrated, and produced by the DCC RPG G+ community under the creative vision and direction of Doug Kovacs, Harley Stroh, Jon Hershberger, Marc Bruner, Matt Hildebrand, and Michael Jones, under the rubric of the Gongfarmer's Local #282. The 2016 Gongfarmer’s Almanac: Volume 7: Tables & Tools Part I is a Dungeon Crawl Classics RPG Zine written, illustrated, and produced by the DCC RPG G+ community under the creative vision and direction of Doug Kovacs, Harley Stroh, Jon Hershberger, Marc Bruner, Matt Hildebrand, and Michael Jones, under the rubric of the Gongfarmer's Local #282. This volume was written by bygrinstow, Keith Garrett, Jon Hershberger, James Pozenel, and Ron Tilton. Art is by Doug Kovacs, Marc Radle, Todd McGowan, Aileen Snyder, and William McAusland. Disclosure: I am credited as an editor. d50 Names for your Zero-Level Characters: Stuck for a name? Here is "Yet MORE randomization for your Zero-Level character creation!" Author bygrinstow supplies 50 names based off the iconic list of authors in Appendix N.
d50 Cursed Magic Trinkets: All that is gold does not glitter, and not all that is magic is safe to touch. Jon Hershberger supplies 50 unsafe magical trinkets for your Dungeon Crawl Classics campaign. Originally published in Fifty Fantastic Functions for the D50. Actually, much of what appears in this volume and Volume 7 may have been initially written for that product! d50 Fantasy Foods: Keith A. Garrett offers a table of weird food items, such as "all-you-can-eat troll loin" and "mermaid roe". d50 Memorable Personality Quirks: A quick and easy table by R.S. Tilton to make any NPC memorable, based on traits that should seem to be oxymoronic or mutually exclusive, but which we all know exist from real life (or social media). d50 Smells: James A. Pozenel, Jr. offers 50 fragrances that might come from that potion vial. d50 Tavern Names and Their Crusty Crotchety Proprietors: Exactly what it claims to be. By Jon Hershberger. Also originally published in Fifty Fantastic Functions for the D50. d50 Treacherous Temple Name Generator: Also originally printed in Fifty Fantastic Functions for the D50, this is Jon Hershberger's temple-generator. Roll 1d50 for each of the five columns, creating more temples than you are likely to need in a lifetime of gaming. 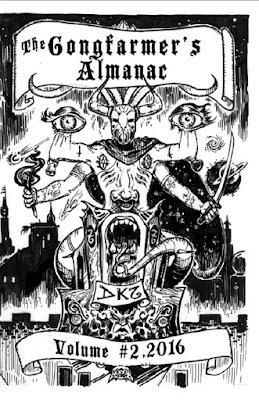 DCC RPG Master ‘Zine Index: Finally, the volume ends with an index of the Dungeon Crawl Classics zines, updated through July 2016. Although attribution is not given, I believe this to be the extraordinary work of Jon Hershberger. The index covers Black Powder, Black Magic; The Cities of Zorathi; Crawl! ; Crawling Under a Broken Moon; Crawljammer; D.A.M.N.! ; Dungeon Lord; The Gongfarmer’s Almanac; The Metal Gods of Ur-Hadad; Myassari; Prayers of the Forgotten; and the Sanctum Secorum Companion. This volume was written by Forrest Aguirre, Victor Garrison, Mike Markey, and James V. West. Art is by Doug Kovacs, Marc Radle, David Coppoletti, Anna Costa, Rick Kammer, Billy Longino, Danny Prescott, Shield of Faith Studios/Matt Jordan, and William McAusland. The Many Divisions of the d120: No doubt you have always wanted to use your d120 to represent other dice on the dice chain. Michael Markey tells you how. What’s This Crap!? A Self-Generating Crud Tool-Kit: A discussion of crud by Victor Garrison and Forrest Aguirre. What’s This Crap!? d30 Crud Creature Compendium: Authors Victor Garrison and Forrest Aguirre provide a "d30 Crud Creature Compendium" exploring "The Realm of Semi-Sentient Slimes, Molds, and Fungi (Plus Wurm, Slug, & Snail Goo, and Other Oozes)". Yes, these really are creatures/encounters that you can use in your game to good effect. For the most part. You may wish to restrict the drumpfungi to Trumphammer 2K. What’s This Crap!? d50 Crud Color and Texture Calculator: Do you need a color and a texture for your crud? Victor Garrison and Forrest Aguirre have you covered. What’s This Crap!? d50 Crud Effects Machine: Do you want that mold, slime, mildew, or other crud to have a real effect in your adventure? Once more, Victor Garrison and Forrest Aguirre have you covered. What’s This Crap!? d50 Crud Odor Description Generator: Including a d4 table for intensity, Victor Garrison and Forrest Aguirre once more give you the tools needed for a memorable substance. What’s This Crap!? d50 Crud Naming Device: Finally, when you have to name your crud, Victor Garrison and Forrest Aguirre have you covered once again. Of course, given the topic, you may not wish to be covered with "flatulent jelly", but there it is, and you can't escape it. The volume is finished with a Character Record Sheet by James V. West (sadly without attribution to the creator). 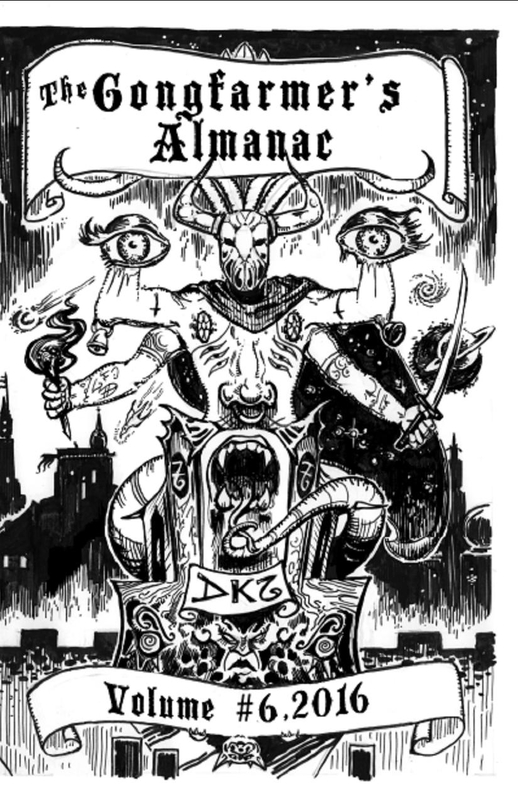 The 2016 Gongfarmer’s Almanac: Volume 6: Crawljammer & Interdimensional Travel is a Dungeon Crawl Classics RPG Zine written, illustrated, and produced by the DCC RPG G+ community under the creative vision and direction of Doug Kovacs, Harley Stroh, Jon Hershberger, Marc Bruner, Matt Hildebrand, and Michael Jones, under the rubric of the Gongfarmer's Local #282. This volume was written by Julian Bernick, Marc Bruner, bygrinstow, Tim Callahan, Jon Hershberger, and James V. West. Art is by Doug Kovacs, Marc Radle, Fred Dailey, Matt Hildebrand, Stefan Poag, and Aileen Snyder. As the title implies, this volume focuses on material related specifically to the Crawljammer setting or inter-dimensional travel. The Techno-Necromancer: This is a Crawljammer class by Tim Callahan that would also be at home in a Crawling Under a Broken Moon, Purple Planet, Madkeen, or Mezar-Kul campaign. The class would actually be appropriate in almost any setting where magic and technology blend. If you feel like cyberanimating the dead, this is the class for you. Crawljammin’ on the Red Planet: a Barsoom Bestiary: Compiled and converted by Jon Hershberger, based on notes from Thomas J. Scott, Allan T. Grohe, Jr, and the Knights and Knaves Alehouse community, this is a bestiary of creatures from Edgar Rice Burrough's fictional Mars and Appendix N staple, Barsoom. To Halls of Valhalla…And Back Again! : Jon Hershberger and Jon Carnes offer house rules for expanding planar travel, including encounters and mishaps. The Oblivion Syndicate and the Millennial Mead: This complete Crawljammer adventure by Julian Bernick centers around "an Elven vintage that matures once a millennium" and a corrupted version of the Perilous League from another universe, which would like to make the PCs' home dimension just like their own. Inter-dimensional Portal Weirdness Die-Drop Table: This drop table is designed to "generate unexpected elements for magic doorways, teleportation gates, and inter-dimensional portals". Author is not attributed. Based upon the list of authors for the volume, and other attributions, my best guess is bygrinstow. The Oculus: a Spacefaring Artifact for Crawljammer: Marc Bruner supplies a magical longship that can ferry PCs through the Phlogiston flux...if they can figure out how to navigate it. Finally, the volume is finished with a Character Record Sheet by James V. West (sadly without attribution to the creator). The 2016 Gongfarmer’s Almanac: Volume 5: Drop-In Adventures is a Dungeon Crawl Classics RPG Zine written, illustrated, and produced by the DCC RPG G+ community under the creative vision and direction of Doug Kovacs, Harley Stroh, Jon Hershberger, Marc Bruner, Matt Hildebrand, and Michael Jones, under the rubric of the Gongfarmer's Local #282. This volume was written by Steven Bean, Marc Bruner, bygrinstow, Marzio Muscedere, Ron Tilton, and James V. West. Art is by Doug Kovacs, Marc Radle, Danny Prescott, and William McAusland. Where the previous volume focused on complete adventures, this volume focuses on areas or events that can be dropped into an ongoing Dungeon Crawl Classics adventure, session, or campaign. The Forgotten Library of the Toadfiend: Author Marzio Muscedere offers a "single room encounter for any dungeon or dire temple dedicated to the Evil Lord of Amphibians". Although it is a single room, there is enough to interest players here for hours. Consider using this location in The Croaking Fane or as an adjunct to the Memories of the Toad God series by Cut to the Chase Games. Tzolk’in Crawl: This mini-dungeon, by Marc Bruner, is inspired by the Mayan calendar, and offers a challenging puzzle with potential for combat as well as profit (if the PCs are daring enough to offend the gods). The area is Meso-American themed, offering both information on gods and a few choice monsters for the discerning judge. There is a Meso-American themed lost race (the Xilonoc) in the Memories of the Toad God series, which this location could easily be tied into. Crawling Under a Broken Moon also makes some use of Meso-American mythology, and has a planned expansion with the Umerican Survival Guide kickstarter. Big Trouble in Little Punjar: Written by bygrinstow off of an idea by Terry Olson, this is a low-level adventure or a 0-level funnel loosely based off of the film Big Trouble in Little China. The Forgotten Hall: This short adventure sees the PCs discover a cyclopean ruin. The judge must have a copy of The Monster Alphabet and The Dungeon Alphabet, and I would strongly recommend rolling ahead of time and developing statblocks for speedier play. R.S. Tilton is the author. Crawling Through a Hell of One’s Own Making: Steve Bean offers a "Meta-Encounter" where the PCs gain a second change to save a fallen comrade from the lands of the dead. Thoughtful and evocative, this could easily be an ongoing part of any Dungeon Crawl Classics campaign. Beyond the Portal Under the Stars: Bygrinstow supplied a toolkit for creating a follow-up adventure to The Portal Under the Stars, where the PCs can both find wood from a dryad's tree and ignite it with the spark of a living fire. Finally, the volume is finished with three copies of the same Character Record Sheet by James V. West (sadly without attribution to the creator). The 2016 Gongfarmer’s Almanac: Volume 4: Complete Adventures is a Dungeon Crawl Classics RPG Zine written, illustrated, and produced by the DCC RPG G+ community under the creative vision and direction of Doug Kovacs, Harley Stroh, Jon Hershberger, Marc Bruner, Matt Hildebrand, and Michael Jones, under the rubric of the Gongfarmer's Local #282. This volume was written by David Coppoletti, Terry Olson, Paul Wolfe, and James V. West. Art is by Doug Kovacs, Marc Radle, Jeff Call, David Coppoletti, Claytonian JP, Benjamin Mara, Diogo Nogueira, Jürgen Mayer, Danny Prescott, and Shield of Faith Studios/Matt Jordan. As the title implies, this volume contains three complete adventures. The Orm Lies Down on Punjar: This is a Terry Olson adventure wherein the PCs somehow gain hold of a bottle of Purple Rhost (from Harley Stroh's Purple Planet) and have what can perhaps be described as a shared hallucinagenic trip from eating the worm contained therein....but one with real consequences and opportunities. It should be noted that this adventure allows PCs to "gain an insight specific to some unsolved problem", and thus feeds into the Quest For It ethos of Dungeon Crawl Classics. In addition, it allows the judge to move the PCs from one location to another...even to another world. Until the Sun Goes Down Forever: David Coppoletti offers an adventure wherein the PCs face off against the "coma cult known as the narcolepers" who "convert unbelievers by promising ultimate, unimaginable comfort in the soothing embrace of eternal drowsiness, dulling themselves against the pain and trauma of everyday life." This adventure includes a table of sleeping disorders. Zeron Protocol: A low-level adventure by Paul Wolfe, this adventure deals with a parasite spawned from the blood of a slain demon. I could be wrong, but I believe that this is the first Dungeon Crawl Classics adventure that is actually focused on the perils of being a PC cleric, with unique disapproval effects and visions. The Chained Coffin, by Michael Curtis, may be this adventure's closest "ancestor" in this regard. Clerics are often an afterthought in role-playing game adventures, so this adventure comes as a pleasant surprise. The 2016 Gongfarmer’s Almanac: Volume 3: Monsters & Treasure is a Dungeon Crawl Classics RPG Zine written, illustrated, and produced by the DCC RPG G+ community under the creative vision and direction of Doug Kovacs, Harley Stroh, Jon Hershberger, Marc Bruner, Matt Hildebrand, and Michael Jones, under the rubric of the Gongfarmer's Local #282. This volume was written by Daniel Bishop, Clint Bohaty, Michael Bolam, bygrinstow, Mike Markey, Stephen Murrish, James Pozenel, Ryan Runton, and James V. West. Art is by Doug Kovacs, Marc Radle, Robert Cameron, David Coppoletti, Benjamin Mara, Mez Toons, and William McAusland. Disclosure: I am credited as an editor, and I have writing in this volume. This table of contents for this volume is divided into two sections: one for Monsters and the other for Treasure, but the contents don't necessarily appear in that order. Let's look inside! The Giant’s Gullet Roll Your Own Encounter: This is a "Choose-your-own-adventure" style offering from Clint Bohaty, that sees the reader, after a convention-game TPK, encounter the DCC world of adventure for his or her own self. The adventure is spread throughout the volume in several parts, with the order jumbled to prevent a simple read-through. Arrows of Anra: On the "Treasure" side of things, James A. Pozenel, Jr. offers "an open-ended collection of unique, magical arrows". Specifically, this is a Dungeon Crawl Classics take on the original Arrow of Slaying. Two Roaches for Your Adventures: Author Daniel Bishop (being myself) offers two fun cockroach creatures for your PCs to encounter. The ironroach swarm is a swarm of metal-eating cockroaches, and carproaches (normal, swarms, and giant) are an "unpleasant admixture of insect and fish". Carproaches will also make an appearance in Curse of Mistwood. Gazette-Fear: The Goodman Games Gazette featured a "Creature in the Corner" with art by Doug Kovacs. Author bygrinstow gives these creatures statistics and a full write-up. Several are individual beings, rather than races of creatures, which is entirely in keeping with the flavor of both Dungeon Crawl Classics and Appendix N fiction. Included are a cursed assassin, a tenacious and irrational species of humanoid that collects man-made objects in their sea caves, an ex-wizard that is slowly turning into a beast, tigerflies from the Faerie realm, and a big-mouthed alien who wanders the Purple Planet as the last of his kind. The free pdfs include some of Doug Kovacs' artwork in color, and are therefore worth obtaining even if you already have the print version. The Cowwitch: A truly nasty surprise by author Robert Runyon, this is a one-time sorceress cursed into the form of a cow, whose charming milk can create a "lactopathic bond" with her victims. On the surface, this is udder nonsense, but when you let it roll around in your head for a little bit, you know that you are going to use it! Ring of Gelatinous Form: Jumping back to "Treasure", Stephen Murrish (edited by James Pozenel) offers a rather gloppy magic item that your wizard might wish he never decided to try on. Thieving Hand of Glamox: Michael Bolam writes: "Inspired by the Lifthrasir’s ring in DCC 85: Making of the Ghost Ring, I created this artifact when the party’s thief lost his hand to a exploding trap. The adventures related to the hand have been quite popular, particularly the interactions with the Zenshire, the Halfling Mafia of Cave-In-Rock, a village located not far from the the party’s homebase. Preparing for the worst, the party soon discovered the Zenshire to be a shadow of their former power. It was just a bunch of graying halflings, some of them missing a hand, who were much more interested in a good sandwich and a smoke than any sort of organized crime. I renamed the village of Thorum (from Crawl! 4) to Cave-in-Rock and placed the Hand of Glamox in the nearby dungeon, but obviously, the artifact can be placed anywhere in your campaign world." The Wandering Eye: Another item written by Stephen Murrish and edited by James Pozenel, "Wandering Eyes are wondrous items created by the Patron Ronco, mysterious Lord of Inventions." Somehow I cannot help but think of Mad-Eye Moody. was inspired by Jacques Belasis’s Scopus, from “Jonathan Strange & Mr Norrell”, by Susanna Clarke. It reminded me of The Soldier and Death from Jim Henson's The Storyteller. The Candle of Finding was inspired by “Shiver in the Pines”, by Manly Wade Wellman, and therefore belongs in any Shudder Mountains campaign. The 2016 Gongfarmer’s Almanac: Volume 2: Patrons & Gods is a Dungeon Crawl Classics RPG Zine written, illustrated, and produced by the DCC RPG G+ community under the creative vision and direction of Doug Kovacs, Harley Stroh, Jon Hershberger, Marc Bruner, Matt Hildebrand, and Michael Jones, under the rubric of the Gongfarmer's Local #282. This volume was written by Steven Bean, Jeff Call, Eric Hoffman, Duncan McPhedran, David Powers, James Pozenel, Ian Wyckoff, and James V. West. Art is by Doug Kovacs, Marc Radle, Robert Cameron, Benjamin Mara, Danny Prescott, Shield of Faith Studios/Matt Jordan, and William McAusland. Cire - Interdimensional Patron: Written up by Eric Hoffman, this is a one-time client wizard of Urhatta who is now master of several pocket dimensions created by Dead Gods.The patron write-up is complete except for a 3rd level patron spell. Patsy, Patron God of Henchfolk: If you have ever seen Monty Python and the Holy Grail, you will know instantly where author Duncan McPhedran got the inspiration from for this patron. The only thing that this full patron write-up is missing is the means for your poor abused henchmen to invoke him...and any judge worthy of that title can deal with that! At a number of points in this text I’ve alluded to increasing Sisssnagagarrasssh’s powers. What I’ve presented here is a patron that is ready to be developed up by you, the judge, and your players. Portal Under the Stars is a terrific adventure that has several strong plot hooks to expand upon. The goal of this work is to give you a head start on what happens after Portal Under the Stars. More invoke patron results need to be added and patron spells need to be created as Sisssnagagarrasssh’s power increases. I wanted to flesh out the snake horn and its creator, but at the same time I didn’t want to provide you with a full-blown DCC Core Book patron. Paul Wolfe’s work on patrons has heavily informed me during the creation of this patron. He has given the DCC community an interesting look at how to develop patrons with differing power levels. How your players and you level up Sisssnagagarrasssh or any other patron is ultimately up to you. 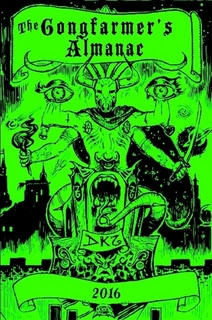 The Children of Ibyk: Speaking of mystic bulls, David Powers offers the write-up of Ibyk, bull-headed Lord of the Black Sun, god of war, wealth, dancing, and lasciviousness, who has now fallen into a low state. Invoke patron results, patron taint, and a 1st level patron spell are provided. Torvak, the Enslaved Ape-God: Jeff Call provides patron information for Torvak, the colossal four-armed ape god of the subterranean Apeman city of Voodos. No patron spells are provided. I can easily imagine an epic high-level adventure where the enslaved ape-god breaks free! Crom!!! : Few fantasy deities are as well-known or as well-beloved as Crom, who Conan the Barbarian swears by. Now Ian Wyckoff gives you clerical information for Crom, the StarSmasher, including a unique disapproval table. I Fought the Law (& the Law Won): Making Law in DCC as Badass as Chaos: Steve Bean provides an "Unabashed (if not Unapologetic) Editorial" to convince you that Law is as worthy an alignment as Chaos. No one ever has too many patrons, and with the price being set at "free", what are you waiting for?